Security Council to vote on American resolution extending international probe on Syrian chemical weapons. Russia could veto. 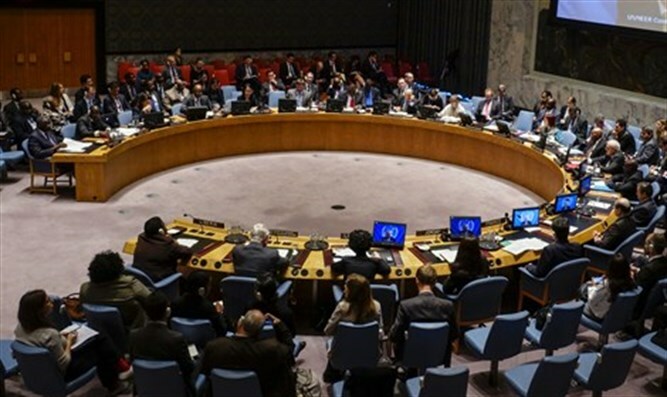 The UN Security Council will vote Thursday on a resolution, drafted by the United States, that would extend for a year an international probe to determine who is behind chemical attacks in Syria's six-year war, AFP reported Wednesday. The United States and Russia, Syria's ally, have put forward rival draft resolutions on renewing the mandate of the Joint Investigative Mechanism (JIM), tasked with investigating Syria's toxic gas attacks. After nearly two weeks of negotiations, the two sides failed to bridge differences and the United States called for a vote on its draft resolution. Diplomats said Russia was expected to also request a vote. "The United States hopes the Security Council will stand united in the face of chemical weapons use against civilians and extend the work of this critical group," the U.S. mission in a statement quoted by AFP. "Not doing so would only give consent to such atrocities while tragically failing the Syrian people who have suffered from these despicable acts," it added. The vote is scheduled for 2000 GMT, just hours before the mandate of the so-called JIM expires at midnight. It remained unclear whether Russia would veto the U.S.-drafted measure, which would be the 10th time that Moscow has used its veto power at the council to block action targeting its Syrian ally. Last month, Russia vetoed a similar resolution that would have extended for a year the mandate the joint UN-Organization for the Prohibition of Chemical Weapons (OPCW) panel which is investigating who is behind the chemical weapons attacks in Syria. In its own draft, Russia insisted that the panel's findings on Khan Sheikhun be put aside to allow for another "full-scale and high-quality investigation" by the JIM, which would also be extended for a year.